30 November 2018 (Toronto, ON) - Grammy Award winning singer-songwriter Alessia Cara releases her highly anticipated second album The Pains Of Growing today via Def Jam recordings/Universal Music Canada, the country’s leading music company. Alessia kicked off her slew of TV appearances over the American Thanksgiving weekend with her profile on CBS Sunday Morning. She will also perform “Not Today” on The Ellen Degeneres Show today and “Trust My Lonely” on The Tonight Show with Jimmy Fallon on Tuesday. Alessia will also be releasing a 3-episode digital short series called "The More You Grow". Watch her first episode "Crushed Dreams" on her Twitter and Instagram. The run-up to today’s highly-anticipated release of The Pains of Growing began as far back as July, when Alessia first performed “Growing Pains” on Fallon and Colbert, then in September on The Today Show’s outdoor Citi Concert Series. Exposure continued this month at the MTV EMAs in Spain (where Alessia won Best World Stage Performance for MTV Spot­light @ Hyperplay), then on Austin City Limits, and just days later at her live performance premiere of “Not Today” on VEVO X. 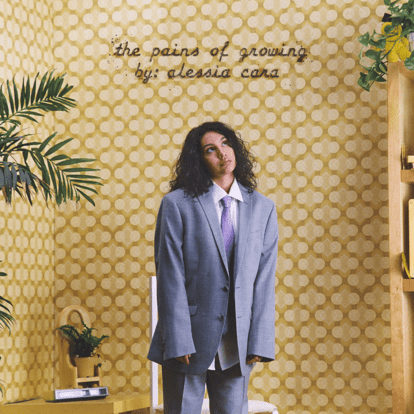 Throughout, Alessia has been draped in the same symbolic, oversized suit she wore in the “Trust My Lonely”, “Growing Pains”, and “Not Today” videos, and now wears proudly on her new album cover. 2018’s “Best New Artist” Grammy Award Winning Canadian singer/songwriter and Def Jam Recordings artist Alessia Cara emerged onto the music scene in 2015 with her global anthem “Here”. Cara’s first release “Here” grabbed the world’s attention when it garnered over 500,000 streams on Soundcloud in its first week, going on to become Spotify’s Most Viral Song of 2015 selling over 3 million copies. A five-track EP, Four Pink Walls, soon followed before the release of the full-length Certified Platinum KNOW–IT-ALL. Alessia lent her voice to “How Far I’ll Go”, the official song for Disney’s animated film Moana, penned by Lin-Manuel Miranda. Her Multi-Platinum #1 hit single “Scars to Your Beautiful” is Cara’s gut-wrenching take on female identity, on body image and on deleterious behaviors in the name of beauty. “Stay”, her #1 hit with Zedd, has sold over 2 million copies and has been called the “Song of the Summer”. “1-800-273-8255”, her most recent #1 smash with Logic went Platinum 5x, contributing to her 6 global smash hits and 8.5 billion streams worldwide. She was one of the most streamed new female artists of 2017.